Sometimes you simply need everything at one glance. 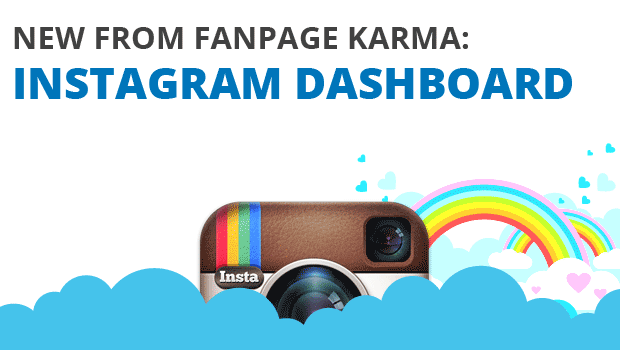 That’s what the Dashboard-View from Fanpage Karma is here for. The most important indicators for as many profiles as you wish are shown here, in one neatly arranged chart. Whether your own channels, competitor-analysis or industry overview – all data in one place. As many Instagram profiles as you wish, at a glance. In Dashboard-View you see your most important indicators neatly arranged. Additionally you can add other indicators and sort them however they are most relevant to you. Simply click on “manage indicators” and select the KPIs you want. With the Drag & Drop feature you can sort them in whatever way you want them. 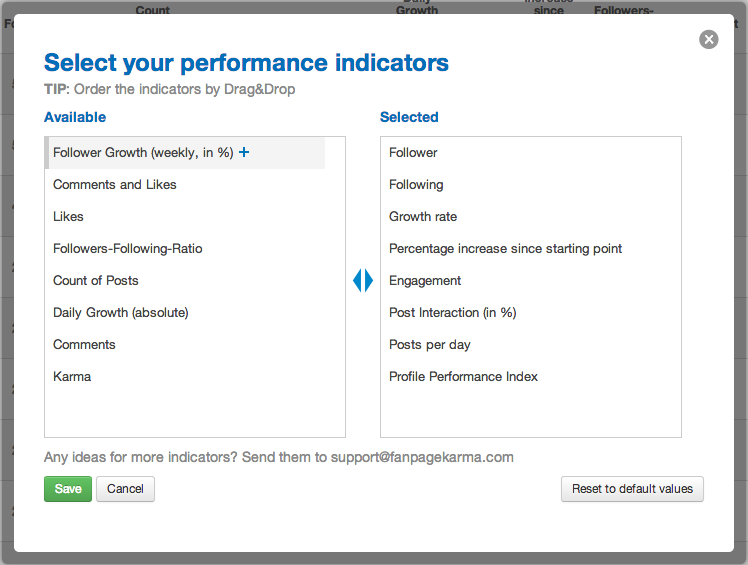 Easily select and sort indicators with drag & drop. How many users follow a profile and how many users does the profile follow? The better the Followers-Following-Ratio, the more active a profile is in the community. Count of Posts shows at a glance how many images or videos were posted in the selected timeframe. This indicator is complemented by Posts per Day, the average number of posts of a profile per day. Additionally we break down how many Likes or Comments those posts collected. Additionally to the single listing of likes and comments we also show you the cumulated amount of Comments & Likes. The Daily Growth (absolute) of an Instagram account describes the absolute increase of the amount of followers compared to the previous day. The Growth Rate shows this absolute development in percentages, therefore the percentage increase or decrease of followers since the day before. If you’re looking at a longer time frame and are not only interested in daily development, the indicator Percentage Increase since starting point becomes relevant, which shows the percentage increase of followers in comparison to the beginning of the examined time span. Engagement shows, how many times users interacted with posts of a profile on average. The engagement is determined by dividing the sum of all likes and comments by the amount of followers of the day. This rate is calculated daily, so if you analyze a longer time span, the average of daily engagement rates is determined. Post Interaction shows, how active the followers of a profile are. It’s an indicator for the quality of posts. The post interaction shows the average amount of interactions (likes and comments) per follower per post. If you, for example, generated 100 interactions with a post and have 2,000 followers, your post interaction would be 5%. Contrary to the engagement rate, this indicator is calculated by post and not by day, so days without posts don’t negatively affect the indicator. The Profile Performance Index (PPI) is the king of indicators and is calculated by combining the engagement rate and the average weekly growth of a profile. It shows the overall success of an Instagram profile and is the best indicator to measure success. The PPI shows how many interactions with a profile take place, how engaged followers are and how fast the profile is growing. The higher, the better. How can you reach a PPI of 100%? By having a higher growth- and engagement-rate than the Top 10% of all analyzed Instagram profiles. You can find a comprehensive explanation of all indicators for Instagram here.